Summer, Summer, Summer! 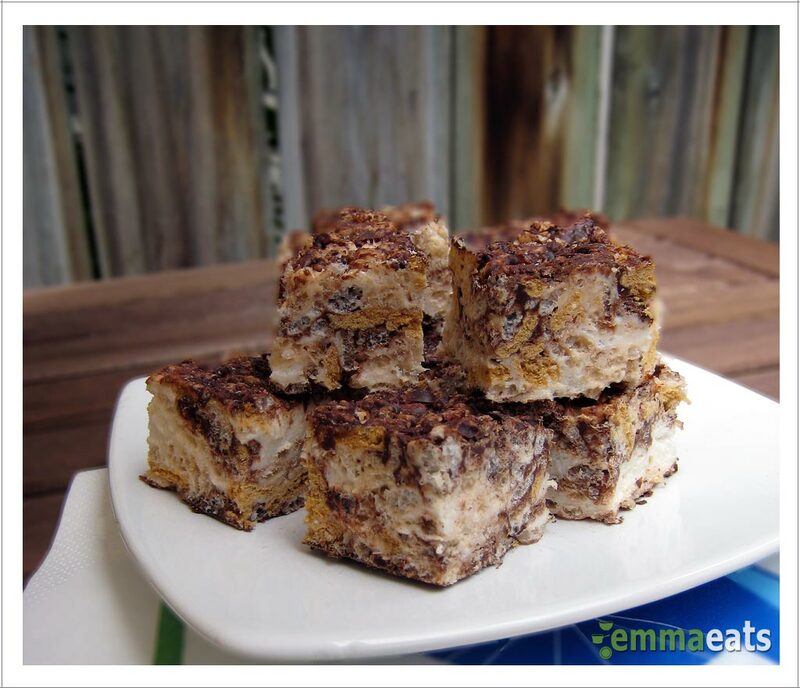 – S’mores Rice Krispies Squares | EmmaEats…and Katie too! The first long weekend of the summer is nearly upon us. Sunshine, swimming, cottaging, fireworks, summer parties – it’s the beginning of the best season of the year. We had our first summer party last weekend for Katie’s first birthday. It turned out to be a glorious day filled with sunshine and blue skies, tiki torches and lanterns, bubbles and pinwheels, barbecued ribs and grilled vegetables, kids running and playing, and tonnes of laughter – the stuff of summer weekend barbecues. To round out the day, we needed to include some desserts. And there is no dessert more representative of summer than s’mores. Unfortunately, local bylaws prohibit us from a big fire in our yard (and not even just to roast marshmallows!) so I needed to hatch a different plan to include them in our festivities. Originally, I planned on making Rice Krispies Squares for our junior party people. One-third of the ingredients of s’mores were already accounted for! And adding chocolate to a Rice Krispie square would just make a good thing even better. All that was left was to figure out how to incorporate graham crackers and we’d be set. That’s how the Golden Grahams made it into the mix. Not a health food by any standard but oh-so-delicious for the kids and grown-ups alike, these S’mores Rice Krispies squares are dairy-free (through the use of unrefined coconut oil) and are super quick and easy. Oh, and they do not require that you break any laws to get your s’mores! Line an 8″x8″ baking pan with parchment paper leaving some hanging over the sides for easy lifting and cutting after the squares are set. In a large saucepan, heat the marshmallows and coconut oil on low and stir until melted. Pour in the cereals and mix until well combined. Remove the saucepan from the heat and sprinkle the vanilla extract over top of the cereal mixture. Mix well and pour the entire mixture into the prepared baking pan. Press the mixture firmly into the bottom of the pan. While the squares are setting, melt the chocolate in the microwave for 30 seconds on medium heat. Remove from the oven and stir. If it’s not completely melted, repeat heating in the microwave but this time for only 15 seconds. Remove and stir and when there are no lumps, drizzle over top of the cereal mixture. Once set, cut into bars and serve. Ensure that the coconut oil you use in the recipe is unrefined, that is, virgin coconut oil. There are generally two kinds available at the grocery store – refined and unrefined. Refined coconut oil can be used with medium-heat cooking and doesn’t taste like coconut. Unrefined or virgin coconut oil still tastes like coconut and retains polyphenols that the refined versions do not. Read the labels on your chocolate to ensure it is in fact nut-free and dairy-free. Some dark chocolate does still contain milk ingredients.